Innovation is not one specific thing, it is a spectrum. It can start with small, incremental changes and expand to radical innovation, creating brand new solutions or disrupting an entire industry. What sits in the middle of the spectrum is customer-centric innovation or what we have termed ‘Differentiated innovation’. Did you do something better today than you did yesterday? A lot of people think that they are not innovating because they are just making small changes, often focussed on the day-to-day operations. On the contrary. What they are doing is innovating incrementally and collectively, many small changes can have a dramatic impact on the profitability of an organisation. Some may be disappointed to hear this but very few people and very few companies have the chance or budget to get involved in radical innovation. We can all name a few real disruptors such as Airbnb and Uber but on the innovation spectrum this still tends to be the minority, though when they come, they radically change the market. Radical innovation needs true desire and significant internal capability to deliver major change, although sometimes circumstances will force the situation and radical innovation is the only way to survive. 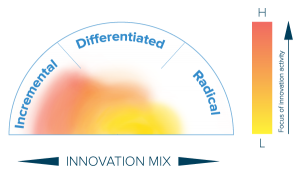 Differentiated innovation starts with the customer in mind and helps you move the needle toward radical innovation. This is the middle ground where we can all get involved – think of new ways to deliver a product, new markets to penetrate, put the customer at the heart of our innovation programme. 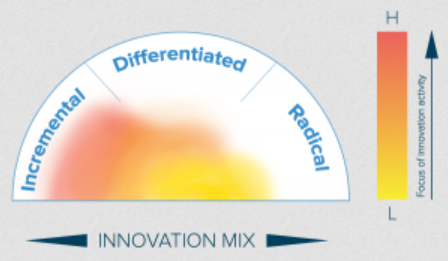 How to move up the innovation spectrum? Whilst, unless forced, it may prove difficult to dive straight into radical innovation, all companies can embrace the concept of differentiated or customer-centric innovation. Whether you already have a foundation of incremental innovation or are initiating a new innovation process, there is no reason why you shouldn’t aim for differentiated innovation provided you have clear goals in place. As with any innovation process, you need to make sure that ideas will get implemented, that there is budget and resources for their implementation. Critically, if you decide to involve customers in creating new products and services, you need to make sure that your organisation is ready to take on this responsibility. The minute you turn to your customer for suggestions, you really need to do something with their ideas. What you don’t want to happen is end up with a lot of customer ideas and not do anything about them. You can imagine what the result will be – the exact opposite of what you wanted to achieve. How do you make sure that ideas proceed to implementation? First, have a robust plan for the whole idea workflow, not just for idea collection, which is only the first step of the process, and identify individuals within your organisation who have the expertise and means to develop ideas into tangible solutions. Sometimes innovation fails not because organisations don’t have the right culture or don’t want to be innovative but because they fail to think about the process of innovation. People forget that innovation is not just about throwing ideas out there, it needs structure. Fail to create an innovation process and you face the risk of losing a lot of valuable ideas. A good process makes innovation smoother and gets ideas implemented quicker. Second, ask people for ideas in areas where you are actually prepared to make changes, aligned to the strategic objectives of your organisation and customer needs, to minimise ideas that have no chance at being implemented. Innovation should not be a one-off brainstorm session, it is a sustainable programme with a solid structure that enables you to harness people’s potential, reward them for their creativity and implement great new solutions in your business, industry or society. What can you do within your organisation to engage the right individuals to take your innovation to the next level? 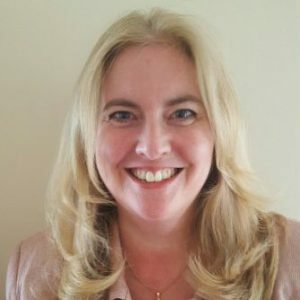 Zena Cox, Operations Director at ideasUK, supporting organisations worldwide in both the public and private sector to maximise their innovation capabilities. Zena’s passion lies in engaging individuals and teams and supporting their development to achieve their goals. Gain a deeper insight into customer-centric innovation.